Those who are looking for attractive and competitive deals to get the desired product(s) and/or service(s) at the best available rates at the place(s) of your choice; must be familiar with SnapDeal (http://snapdeal.com). If you are not, then keep visiting the site on the regular base(s) and you will find some really cool and attractive deals, which we believe worth sharing. Though we are not giving you the overview of this website here, right now (may be sometime in future, it will be there, who knows! ); but we are going to share a story with you which is something different. 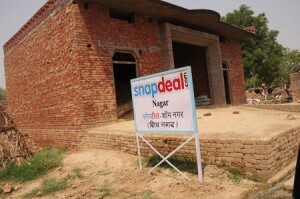 There is a village in India “Shiv Nagar” now renamed to “snapdeal.com nagar”; and most importantly it is not marketing gimmick, or not a business stuff or similar. It is the genuine tribute by the people of “Shiv Nagar” to the generous efforts of “snapdeal.com”; which made their live(s) much better. Surprised!! We too, when we got the news first. As you may know, the site is in existence since almost one and a half year. The management team of snapdeal.com, have experience in various fields of the society and they wanted to do some stuff for the society. After thinking on various factors, once when in meeting, one of the employee have stated about his native “Shiv Nagar“. He told that people have to go about around 3 kilometer walking to get water; this is where the management team thought to start with. A nice way to do some stuff for the society. The locals of the village now need not to walk for around 3 KMs and stand in the line to just get clean water. In the gesture of appreciation, the village people have decided to rename the village from “Shiv Nagar” to “SnapDeal.com Nagar“. Here is the village name sign board. Kudos, to SnapDeal for this social work. Companies like you made the world a better living place. This Post touched my heart. I appreciate snap deal for it. It helped so many people.